Do you long for the days where men were men, and they usually died before age 30? Do you wish you lived in a time where people lived with purpose, before slipping into the ether due to a horrible diarrhea-induced death? Do you long for the days when chivalry was a way of life, and often resulted in meaningless wars of succession? So what the heck is going on here? Well, Battle of the Nations is a national team sport that features two 21-man teams competing in full-contact, weapon-based combat. Competitors are eliminated when they fall to the ground (that is, having any three points of support) and the last team with men on the field wins. Unfortunately, it doesn’t feature jousting. 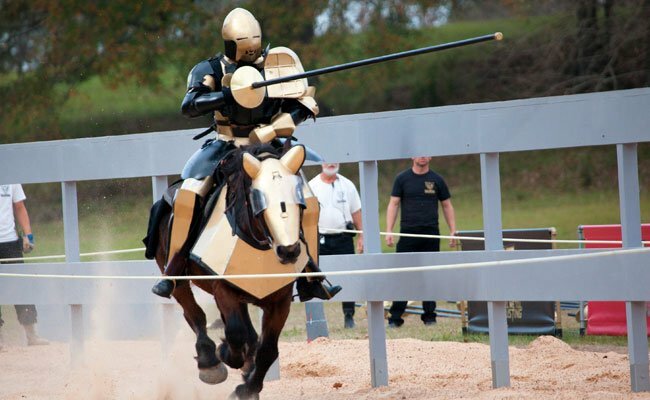 Photo from the short-lived Full Metal Jousting series. In addition to 21 vs. 21 battles, there are also 1 vs. 1 competitions named “triathlon duel” (which has three rounds where each man uses different weapons) and “professional fight” which is basically point karate…but with weapons and armor. Each year, more than twenty nations from around the world compete for a prize pool distributed among the top eight teams. The competition has been going on annually since 2011 with the most recent installment taking place last May in Prague.